Exciting news! Our new course Flash Animation is now available for purchase. So what is this course all about? 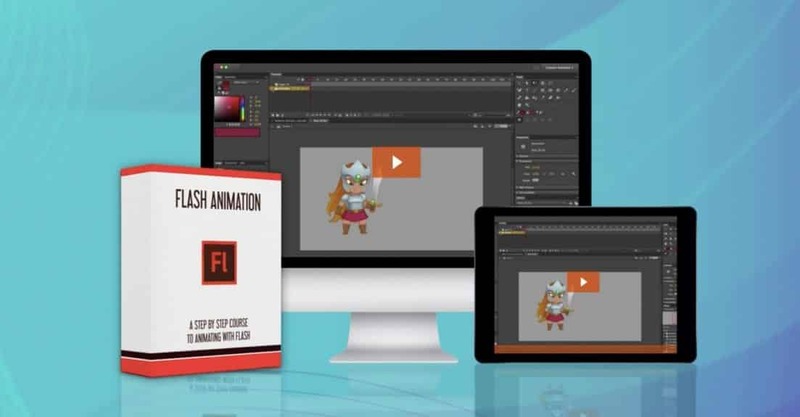 In a few words, this course is all about becoming a flash animator. Either for making cool animations for YouTube, or 2D frame-by-frame animation for commercial use. The course consists of 34 comprehensive HD video lessons (over 3.5 hours of content) and is made specifically for aspiring animators. No Flash experience needed. In this course I will take you step by step through all the tools and methods for animation in Flash. We’ll start by going over the Flash interface and understand how to work with different layouts, and how to select and manipulate objects. We’ll show you all the different tools for drawing inside of Flash, including the pen and line, pencil and brush, the paint bucket, all the different shapes tool and also how to work with color. After we know our way around Flash, we’ll dive straight into the animation part of it. We’ll go over all the different methods of animation in Flash. How to use symbols, using the 3 different tween systems, and using masks. We’ll spend the majority of the course showing you step-by-step how to create a fully animated shot in Flash.We’ll construct an entire character in Flash, fully rigged for animation and lip sync. We’ll create a complete animatic in Flash and then animate a shot using frame-by-frame animation, bones and rigging and motion tween. When the work is done, we will go over the different export options. Made for Animators, experienced or Newbies. As an animator, I’ve designed this course to be tailored specifically for people who want to make animations. Flash is a very easy software to learn, though it takes time to master. I’ve brought in an amazing 2D Flash animator to take you through the complete journey of making a full animation using only Flash. We’ll show you how simple it is to get amazing results with Flash.